During the week I went to the Twilight Tango concert at the Sydney Conservatorium presented by the Sydney Youth Orchestra and the Sydney Conservatorium - see posting below. If you missed it - you missed a treat! It was an evening of fantastic live tango music presented by dynamic young musicians led by Maggie Ferguson. 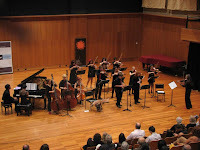 Musicians are drawn mostly from both the SYO and the Sydney Conversatorium - and auditions are open for 2010. As well as the superb TangoOZ which is an associate of the Orquesta Escuela de Tango in Buenos Aires, we were treated to performances of a number of different tango ensembles that have been formed by the students. Outstanding amongst these was the Carlos Gardel band playing 'Por Una Cabeza'. On Saturday night as I sat watching the dancers on the floor at the elegant City Tatts milonga - a beautiful dancer caught my eye - and that of just about every one else in the room. She was dancing elegantly, simply and beautifully with one of Sydney's teachers and I was fortunate enough to be sitting with someone who could tell me who she was, as I had never seen her before. Her name is Belen Silva and she has apparently been teaching in Japan, though she comes from Argentina. So I did a little hunting on Youtube and found a video of her.